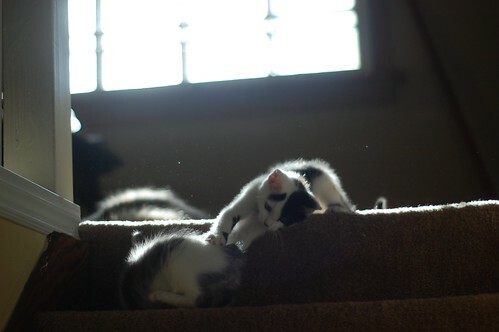 From time to time, and only when they are being very, very good, the kittens are allowed to come upstairs to play. It's fun up there. There's lots of sun, and lots of carpet, window ledges low enough to jump up on, and stairs to climb. 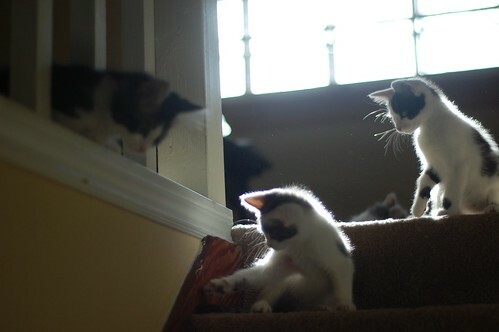 Because the Furmans are very good kittens, they were allowed to venture upstairs the other day, and a good time was had by all! Sunshine, kittens, and whiskers....I'm not sure even chocolate could top that! OMG I want to bury my face in their floof-i-ness! Oh the floof in the sunlight! So lovely! The "halo" effect of backlighting is always so great on floofballs such as this. Looks like a good time was had..
Off-topic.. but have to thank Laurie for the idea of the bathtub soccer with ping pong balls from one of the kitten groups some time ago. As I write this, there is an epic game going on in the spare bathroom tub.. "Ceiling Cat" vs "Basement Cat". I suspect that it won't be long before the ball goes out of play and into the living room. The floof melts me into puddles! Looks like they're having a nice holiday treat! Could I ask how you keep them from getting upstairs? I know you keep the litters in "kitten quarantine" when they first arrive; are they secluded behind a closed door, or do you have some other kind of special kitten barrier? Can't you just hear in the first two, "Come on! Give me your paw! I'll help you up! You can make it!!!!!" Did you name them the Furmans because they are all so furry? Love the pics. I bet the kittens loved the adventure! Awwww, they are good kittens. So sweet. When I took my girl to the Vet for her first visit, I had to fill out the paperwork. It asked long hair or short hair. I put long because it looked long to me. The vet tech looked at my paperwork and then looked at Noodle and said, "Oh no, she's not long haired. 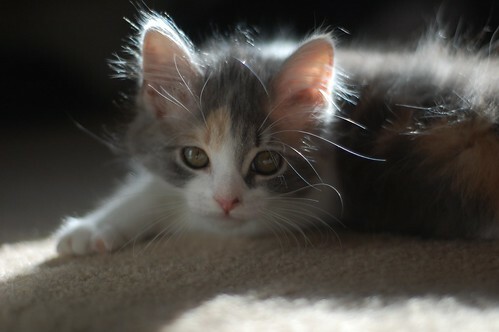 That's just kitten fuzz." Now seeing these pictures, I understand the difference! That's not "upstairs", that's HEAVEN. I just know heaven is filled with little haloed kittens, cats, puppies, dogs, and those who love them. WOW - makes me thankful for IBKCland! Ooh, they all look so happy! Baby Edith is still killing me with her big beautiful eyes and adorable floof. And Lil' Crazypants must have been especially good if he was allowed to join the others! Oh how adorable! 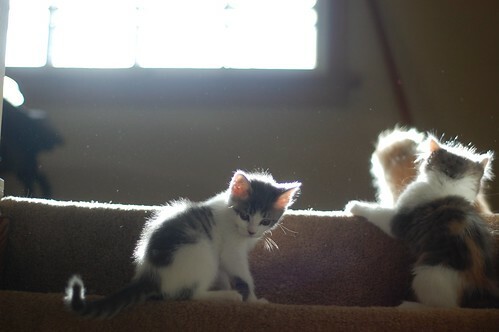 We love to see those kittens having FUN! 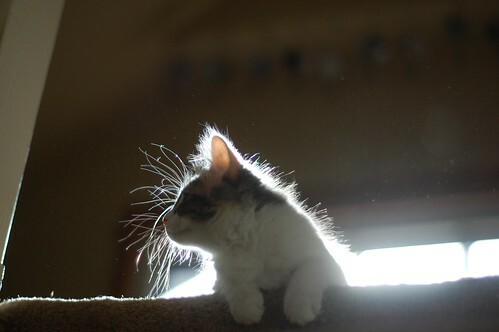 That last pic ~ "whiskers in sunlight" is gorjuss! oh wow, what an adventure for them! They look absolutely thrilled (and adorably fluffy)!! Isn't it amazing how much joy all the itty bitties bring to us, their groupies, just by being their sweet selves? 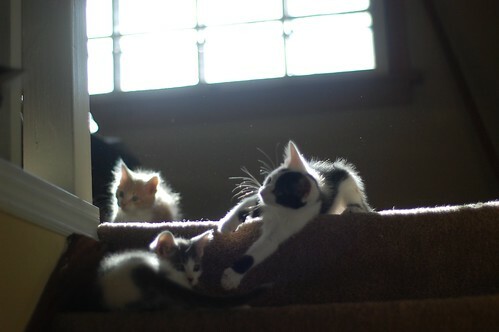 This adorable batch is simply exploring upstairs (or Heaven, as Anne Boleyn puts it), yet they've charmed us all. Bless their floofy little hearts. Jessica, there's a door to the upstairs, so we just keep it closed. When they are in quarantine, they're usually kept in our guest bedroom. Sometimes they're penned up in the kitchen.